Our Alaska kids live outside! They play hard in winter, snowmachining, skiing, sledding, even the time spent outdoors in school recess requires special gear. In Summer they fish, hunt, or just play on the banks of muddy rivers while mom and dad fish and hunt. That's why we sell gear tough enough to handle whatever outdoor activity Alaskan kids enjoy! 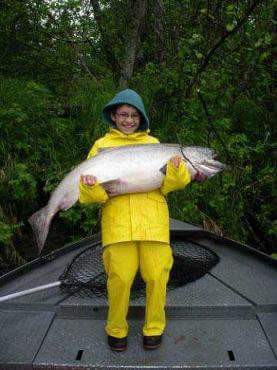 Our son, Nick, with his first Kenai King!